The Mayan civilization was the most magnificent and longest reigning civilization of the Mesoamerican region. The Mayans had a fully developed language which made extensive use of logograms and glyphs. Being an independently developed language, Mayan words also had independent roots and the language had its own grammatical rules and structures. However, it is also true that there was not a single language of the Mayans and different variations were spoken by people in different city states and areas. Based on these differences of grammar and Mayan words, scholars have classified the Mayan languages into different language families. The history of Mayan words and the languages can be traced back to the Proto-Mayan language which was spoken about 5,000 years ago. At that time there was only one language spoken in the region and thus there were limited number of Mayan words. With the passage of time, however, slight variations in language accumulated in different regions which over time gave rise to distinct languages with their own vocabulary and grammar. By the time the Mayans entered their Classic Period (250AD-900AD) there were already multiple Mayan languages spoken in different Mayan kingdoms and city states. Most common aspect of word formation for Mayan words includes compounding of noun roots to form new nouns. Most common aspect of word formation for Mayan words includes compounding of noun roots to form new nouns. Additionally, different morphological processes are used for the derivation of nouns from verbs. Another aspect of word formation for Mayan words is incorporation of noun stems into verbs either as direct objects or in other functions. Word formation also includes widespread metaphorical use of roots signifying different body parts, particularly for formation of locatives and relational nouns. This last aspect is true not just for Mayan languages but also for various other Mesoamerican languages. Mayan loanwords are those words which, over the years and centuries, have seeped into various other languages and become part of those languages. There are several such Mayan loanwords which are part of not just other Mesoamerican languages but also various European languages including Spanish and English. Conversely, Mayan languages have also loaned words from outside languages, most notably Spanish. One example of Mayan loanword into the English language is the word “cigar” which has been derived from Mayan word “sicar” which means “to smoke tobacco leaves”. Another example of a Mayan loanword is the English language word “shark” which has been derived from Mayan language word “xoc” meaning “fish”. This two-way movement of words has enriched languages on both sides. The script used for the writing of Mayan words during the pre-Columbian era is known from the engravings on different archeological sites which have been deciphered almost completely. This script makes extensive use of logograms and also consists of a syllabic system. Mayans also wrote the language and words on codices most of which, however, were lost due to the humid weather conditions in the region. A drastic change in the writing system of Mayan words was brought about during colonial times when the Latin alphabet was introduced in the Mayan language. This considerably increased the power of expression of the language. During the pre-Columbian period, the most common method of representing Mayan words and hence recording the language was the use of glyphs. 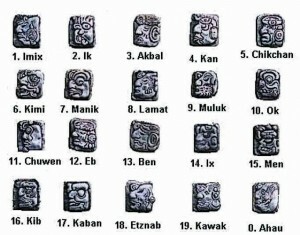 The earlier civilizations, such as the Olmecs, also made use of glyphs so Mayans were probably influenced by them. The glyph writing system was a fully developed writing system which could unambiguously express any sentence of the written language. Multiple Mayan languages have been identified in hieroglyphic texts. The use of glyphs for representation of Mayan words and language continued until the Spanish conquest in the 16th century after which the Latin alphabet was introduced into the language. With the colonization of the Americas, several changes were brought about in the Mayan words and language. The most crucial was the introduction of Latin alphabet which considerably enriched the Mayan languages. Colonial orthography also made various attempts to transcribe the ejective consonants. For example, distinctive letters for ejectives in various Mayan languages were invented by Francisco de la Parra in 1550. These became almost permanent part of these Mayan languages. In another instance, consonants were doubled for ejectives in Otomi language by Alonso Urbano in 1605, among other approaches. At the initial stages after colonialism, the Latin alphabets introduced in the Mayan languages were not standardized and varied from writer to writer. It was only recently that standardized alphabets for the representation of Mayan words were established. For instance, one of the most important contributions of modern orthography was Diccionario Maya Cordemex which was the first widely accepted standardization of the alphabets. Multiple authors contributed in this project and it was supervised by Alfredo Barrera Vasquez. The standard from this project was eventually adapted for 22 Mayan languages primarily in the region of Guatemala. Some other conventions and standards are used for some Mayan languages in the Mexican state of Chiapas. With the introduction of Latin alphabet in the Mayan languages following the Spanish conquest, the power of expression of Mayan words and languages increased considerably. This made it easier to produce literature in the indigenous languages. One of the foremost examples of Mayan literature written used Latin script is Popol Vuh which is a mythical-historical narrative written in the 17th century but heavily depending on the earlier Mayan sources. Priests and friars were the main driving force for the Mayan literature at earlier stages but eventually more writers and poets contributed in the corpus of Mayan literature. Mayan words are part of Mayan languages that thrived over the course of several thousand years in and around the Yucatan Peninsula. These words and languages were derived from the earlier Proto-Mayan language which existed in the region as early as 5,000BC. With the passage of time, this language diverged into multiple languages and thus the Mayan words increased and flourished under each language. Mayans made use of glyphs to represent the Mayan words but after the Spanish conquest in the 16th century, the Latin alphabet was introduced which opened up new avenues for the enrichment of Mayan words.